The final instalment in Victorian Opera’s Sondheim trilogy, Sweeney Todd: The Demon Barber of Fleet Street – A Musical Thriller will carve a bloody path of revenge through Victorian London at Arts Centre Melbourne for a limited season from 18 July 2015. The macabre musical follows Sweeney Todd as he returns to London following a wrongful conviction and transportation to a penal colony, seeking revenge against those who separated him from his wife and child. On arriving in London he meets Mrs Lovett, who owns a failing pie shop and recognises Todd as his real name Benjamin Barker. She quickly tells him his wife Lucy died at the hands of Judge Turpin, who keeps his daughter Joanna locked up as his ward, intending to marry her. As she reveals his shaving razor his arm ‘feels complete again’ and he sets up his barber business above Mrs Lovett’s shop. Seeking revenge leads to murder, and prompted by Mrs Lovett his victims become fresh ingredients for her pies which boost sales and lead to the tragic conclusion. The multiple Tony Award-winning musical has remained one of Sondheim’s most popular works since its Broadway debut in 1979 and in the West End in 1980, and immortalised on film in Tim Burton’s 2007 adaptation of the work. 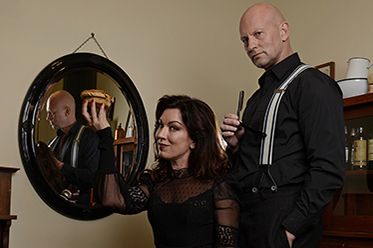 In this production, Teddy Tahu Rhodes will make his role debut as Sweeney Todd, with Victorian Opera favourite Antoinette Halloran in the iconic role of Mrs Lovett. Stuart Maunder returns to direct Sondheim’s deliciously wicked musical following acclaimed productions of Sunday in the Park with George (2013) and Into the Woods (2014). “The language is archaic, the musical is operatic in scale, the setting is Victorian England but in this most thrilling of musical treatments, we can make the leap… this is a tale for our times,” says Maunder.